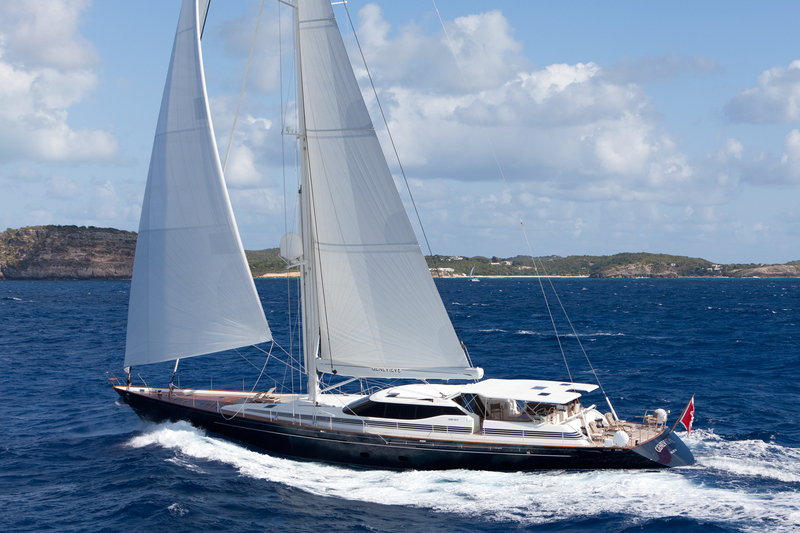 The 37m luxury sailing yacht GENEVIEVE was designed by Dubois and built by the highly respected Alloy Yachts in 1996. This is a beautiful sloop with high interior volume and all the amenities for a wonderful charter experience. Luxury sailing yacht GENEVIEVE has a spacious and elegant interior, with attractive wooden cabinets and paneling, and beautifully decorated in creams, caramel and mocha, creating a chic and relaxed ambiance. Charter yacht GENEVIEVE has a good sized main salon with sumptuous sofas and bespoke chairs, and an attractive upper salon with table seating and a bar, with panoramic views. Above decks the luxury sailing yacht GENEVIEVE has good deck space forward laid out with sun beds, with further sun beds aft. There is also a good sized deck lounge and a flexible dining area in the cockpit. This can be adapted to suit the occasion, wither with two cocktail tables, one cocktail and one dining table, or one large banquette capable of seating 10-12 guests. The large swim platform is another great feature, allowing you to board the tender effortlessly, or simply dive into the water for a spot of snorkeling. Sailing yacht GENEVIEVE is well equipped with Wifi/ Internet and Satellite TV, DVD and CD players, and a good range of water sports equipment, including a 5.5m Ribtec Tender with 100hp outboard engine, a 4m Achilles Tender with 25hp outboard engine, 2 Inflatable Kayaks (2 person), Water Skis, a Wakeboard, a Kneeboard & Tows, Snorkeling Gear and Fishing Gear. 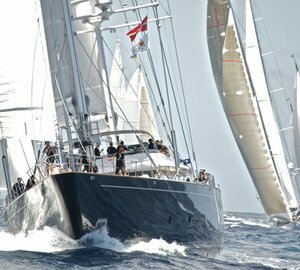 Charter yacht GENEVIEVE measures 36.9m (121.1 feet) in length, with a beam of 8.2m (26.9 feet) and a draft of 3.3m (10.8 feet) and cruises comfortably at 11 knots. Master double cabin with shower room en suite. 1 x VIP double guest cabin (queen) with shower room en suite. 1 x double guest cabin (lower berth) with additional single upper berth (fixed berth) with shower room en suite. 1 x twin guest cabin with shower room en suite.